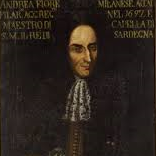 Andrea Stefano Fioré is in our times an unknown composer. He was born in Milan in 1686 and was twelve years old when he became member of the Accademia Filarmonica of Bologna. His father was a cello player in Turin and obtained from king Vittorio Amedeo II the permission for his son to go to Rome in order to study with Arcangelo Corelli. When he was 21 he became chapelmaster in Turin until 1732. During this period, having left the violin he devoted himself to composition and direction (the duties of a chapelmaster) and was in contact with many composers of his time, among whom we remember Benedetto Marcello and Francescantonio Vallotti. His works spread all over Europe: we know about 36 operas performed in different theatres of Europe (Palermo, Praga, Milan, at the Teatro Ducale, later Teatro alla Scala). He composed also many sacred pieces for the king’s chapel in Turin. These pieces, for us, after three centuries, still have the particular charm of baroque music in a style between Italy and France.